Hey y’all! We sure have been having a stint of BEAUTIFUL weather here in the South! In the 70s nearly every day for the past several weeks. Things are budding out, bulbs are coming up, it’s really starting to seem like spring. To take advantage of the beautiful weather, we spent last Sunday out on my Dad’s land. 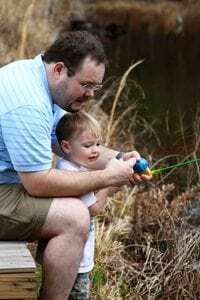 It was a big day because it was the first time I was able to take my little guy fishing, cooking hot dogs over an open fire, riding on a 4-wheeler, and learning to shoot his Red Ryder BB gun! We squeezed a bunch of firsts into this one! He had a blast, and we had a blast. So nice to get outdoors with family and soak up the sun. I hope you all are able to do start doing that soon! When we got in Sunday afternoon, we all were tired, but HUNGRY. So I whipped up one of my family favs, Smothered Chicken. 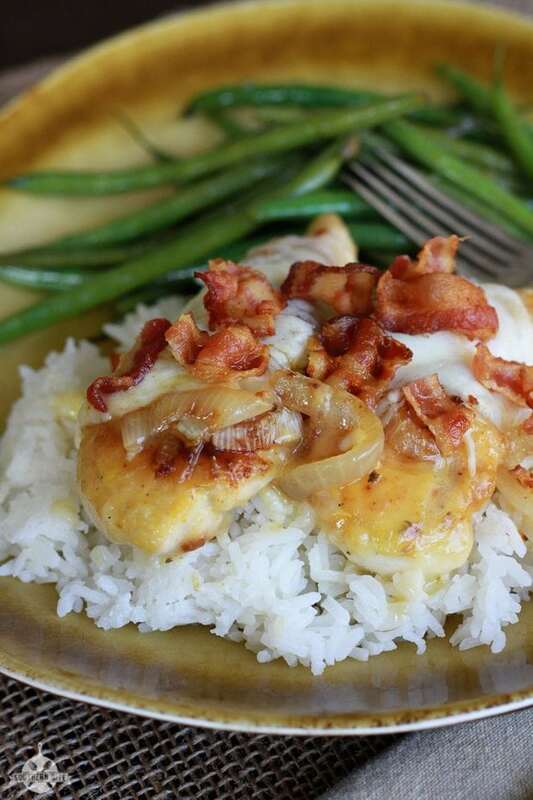 I’m not sure what it is about Smothered Chicken that makes people come ‘a runnin’, but it does. And the best part about this recipe is that it’s one of those quick and easy oh-no-I-don’t-know-what-I’m-cooking-for-supper meals. I put this together and had it on the table in less than an hour. Yummy! 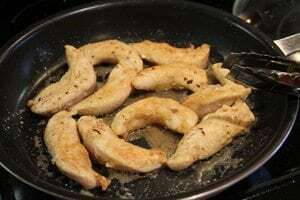 Preheat oven to 350 degrees F. Season chicken tenders with salt and pepper and lightly coat with all purpose flour. 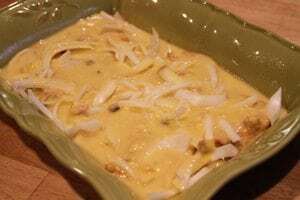 Place chicken in greased baking dish and top with sliced onions. Combine cream of chicken and mushroom soup with one can of water and pour over chicken. Bake uncovered for 25 to 30 minutes, or until chicken is cooked through. 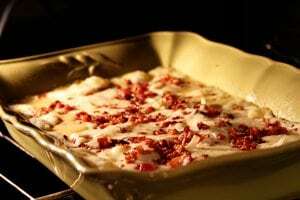 Remove from oven and top with cheese and crumbled bacon. Return to oven 5 to 7 minutes, or until cheese is melted and bubbly. Serve over hot white rice. Preheat oven to 350°F. 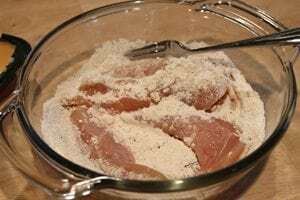 Season chicken tenders with salt and pepper and lightly coat with all purpose flour. Lightly brown chicken in bacon drippings. This is one can of soup that is Cream of Chicken and Mushroom, not two different cans. It’s actually one can of soup that is Cream of Chicken and Mushroom – it’s all in one can. But, you could use Cream of Chicken or Cream of Mushroom. I just use the combo one. I like that soup but sometimes not easy to find. Would this work to prep and freeze uncooked for the next day? 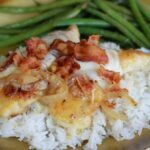 I really like smothered chicken and your recipe sounds great! That’s great! 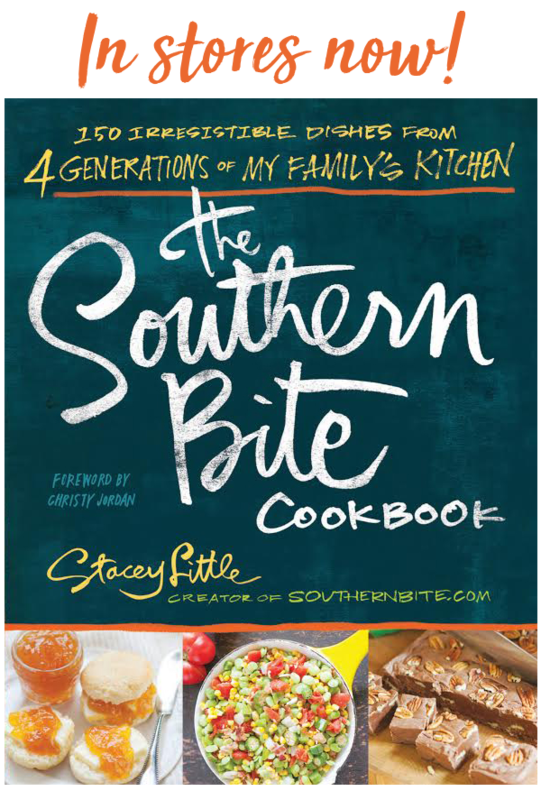 You can be an honorary Southerner! But you know, you don’t have to be from the South to love Southern food! Fantastic recipe! I too love Campbell’s Cream of Chicken with Mushroom Soup…it makes a great fried chicken gravy too, with the drippings plus 1 can of soup and a can or so of milk, cream, or even water. Serve over rice. 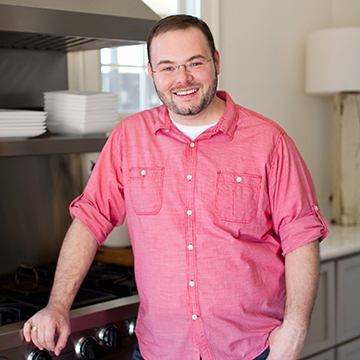 I’m new to your site, recommended by The Southern Lady Cooks via Facebook, and I’m really enjoying reading all your recipes and can’t wait to try them! Thank you! Out of curiosity, and being a Yankee married to a southerner, what is “that pre-cooked bacon stuff” used in lieu of bacon drippings? Welcome! You can buy precooked bacon, but if you do that, you’ll need to replace the bacon drippings with a little vegetable oil. Would this cook in slow cooker, adding cheese when done? Absolutely! Just be cautious about cook times and temps. Stacey, I’ll be making this tonight! Also the picture of you and your sweet little boy is just precious. OMG!!! This sounds and looks so DARN good!!!!! Thank you for the great recipe!!! Now this is easy and delish. I added it to my November Menu and I will let you know how the family likes it. I mean how can you go wrong with bacon and chicken. BTW the photo of you and your son look identical. So sweet and I miss you my friend. Fingers crossed you can make this way. If not I do understand and I just know we all will see each other again. 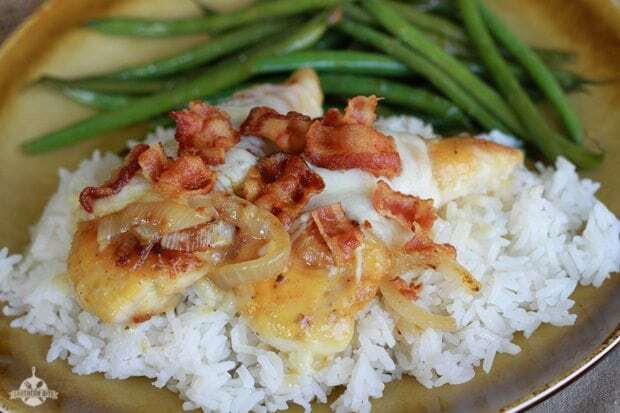 I am making this tomorrow night when my oldest son (19) brings his new GF over for dinner. He bragged about my blog and my cooking and now I am making a new dish, no pressure right? I am sure it will be delicious.. I can’t wait. You’re a brave woman! But you’re a great cook, so I know it turned out great! The chicken sounds yummy. I saw the cream of chicken and cream of mushroom, combined in one can and thought this would be good in something. Well, now I have a recipe for it. I use good ole bacon grease.Love it in my greenbeans, along with some onion. Thanks for all your recipes. I just have to say I made this tonight for my husband and son and it was a big hit! I used extra bacon grease since I always save my leftover bacon grease drippings in the fridge. Also I was short on flour so instead of flour I used bisquik very tasty. Thank you for the recipe I will be making this again for sure. So glad y’all enjoyed it! Hi Bettie! I’m so glad everyone enjoyed it! Do you have any nutritional or serving size info for this dish? Sure. The flavor will be different, but I’m sure it will still be delicious! wow, I made this for my large family tonight and it was so good, flavor like crazy!! Thanks for this everyone loved it! So glad that y’all enjoyed it! Do you know how this would freeze? I like to freeze leftovers for quick meals later since there are only two of us to eat it all. I’m trying this tomorrow. Looks yummy! I have made this recipe once, and it was absolutlely delicious!!!! I plan on making it again this weekend. Wonderful!! So glad y’all enjoyed it. I hope you’ll enjoy it just as much the second time around! 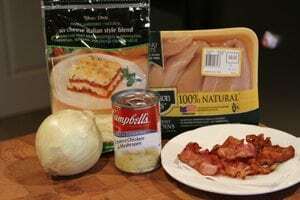 I’m making this right now for dinner tonight. It’s in the oven. Can’t WAIT to eat it…it sounds delish!! I sure hope you enjoyed it! This recipe sounds great. I have fixed a lot of your recipes and never been disappointed. Could I use a rotisserie chicken instead of the chicken tenders??? Loved the pic of you and the baby boy!!! Hi Penny! Thanks so much!! I’ve never tried it that way, but it would stand to reason that it would work. The cook time should be less though being that the rotisserie chicken is already cooked. Anything with bacon involved is a winner in my book. I am so looking forward to trying this recipe soon. Yum! Yes it is! And this is one of my favorites!! We just had it the other night! Sure. You’ll just have to adjust the cooking time appropriately. Hi, love this but the family does not do crunchy onions!! So I cook them with the chicken a bit and all is happy!! Thanks for the recipe. Good way to adapt to your tastes! I’ve made this a few times, (using your cookbook) and we love it! Couldn’t find the soup mix, so I use cream of chicken with a small can of (drained) mushrooms instead. I also add a couple of handfuls of frozen spinach. It doesn’t change the flavor and adds a little more nutrition. Wow! Those are some great ideas! Way to make it your own! NO! I don’t want cheese or soup anywhere near my real gravy! First you make a roux! I read your recipe last night before bed. I must have dreamt about it since I woke up remembering I’ve made this in the crockpot. I didn’t brown tho! Served over rice and everyone licked their plates clean! To make it richer I use your soup and a can of mushroom soup instead of water. Guess what’s in my crockpot today! Thanks for the great recipe!